Sugar St. Clair is the dame who’s sweet like a glass of champagne! She is a founding member of Milwaukee’s own Brew City Bombshells and has nearly 10 years with the local burlesque, vaudeville, and drag community. She was proud to represent Milwaukee in the 2013 Minneapolis Burlesque Festival and headlined Wisconsin’s very first burlesque festival in 2016. Sugar is also immersed in fashion and costume design and likes to spice things up with a little fire eating from time to time. Sasha D’light began taking root with her genuinely perky attitude and gothic undertones in the underground scene of St Louis in 2010. Since then she has been a slave to seeking knowledge, traveling the country training in the world of kink, fire, flow arts, and burlesque. She also specializes in work backstage with theatrical stage management, directing, and lighting design work. Her fire doesn’t stop there though! Based now in central Iowa, she uses some of her free time to extend a hand and share the Arts with all who are eager and have dedication in her eyes. She’s performed her tricks across Iowa, through St Louis, and she’s thrilled to be returning this year to the Night Carnival with her female-focused fire troupe, the Sisters of the Eclipse. 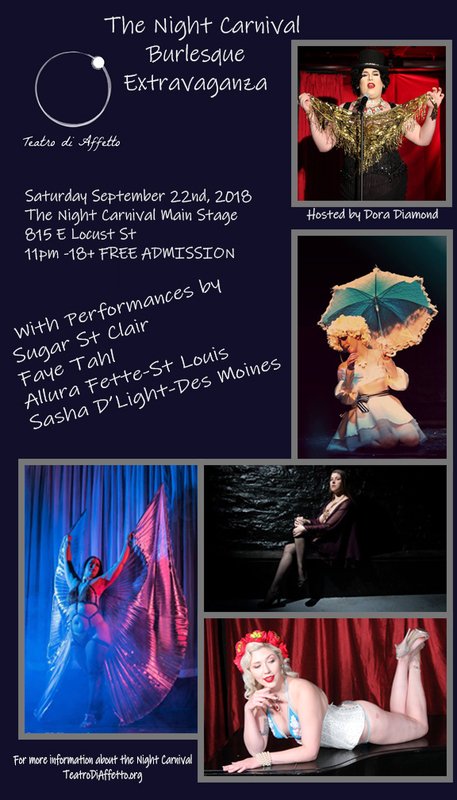 Dora Diamond returns to the Night Carnival to emcee our fabulous burlesque show for a second time! She currently acts as emcee for the Brew City Bombshells as well as the Cream City Cabaret, and she works extensively with Cabaret Milwaukee, both onstage as an actress and as their jazz chanteuse. But no matter what she’s doing, she’s always showing audiences that nothing sparkles like a diamond!